Explorer looks sharper than ever thanks to a minor refresh for the 2018 model year. The SUV shows off revisions to its front and rear fascias, along with offering five new wheel designs and four new paint colors, including: Burgundy Velvet Tinted Clearcoat, Cinnamon Glaze, Platinum Dune Tricoat and Blue Metallic. 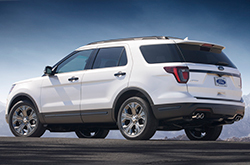 Also this year, if you choose to buy or lease a new 2018 Ford Explorer in the Phoenix area, you can select a model with the available new Safe and Smart Package, which enhances security and value with technologies like collision warning with brake support. Continue Peoria Ford's 2018 Ford Explorer review for further details! The seven-passenger Explorer provides plenty of choices for Peoria and Phoenix-area drivers. Five well-appointed trim levels are available each with its own character: Explorer, Explorer XLT, Explorer Limited, Explorer Sport and Explorer Platinum. This year, the SUV offers an available 4G modem with a standard new Wi-Fi, which 2018 Ford Explorer reviews call a good option for those who want to stay connected. The hotspot can support up to 10 devices and works up to 50 feet away from the car. Other highlights include SYNC 3 and SYNC Connect which works with FordPass to give you remote vehicle access. Standard features on the base model are also notable, including the likes of a rearview camera, Bluetooth, the base SYNC system and rear climate controls for your backseat companions. Exploring is made all the more fun with a choice of three peppy engines. The first is a 2.3L EcoBoost four-cylinder that produces 280 horsepower and 310 lb-ft of torque. 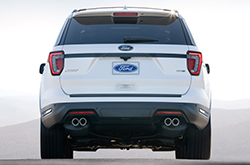 For the most power, there's a 3.5L twin-turbo EcoBoost V6 with new quad exhaust tips; the six-cylinder generates 365 hp and 350 torque to power your adventures. There's also a 3.5L naturally aspirated TiVCT V6 with 290 hp and 255 torque, which falls in the middle on the power scale. When you have a chance to test drive the 2018 Ford Explorer in Peoria, make sure you try out all three engines. 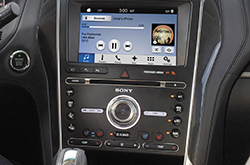 Explorer offers an available new Safe and Smart Package that includes a long list of driver-assist technologies. The suite includes blind spot monitoring, adaptive cruise control, collision warning with brake support, cross-traffic alert, auto high beams, a lane-keeping system and rain-sensing wipers. 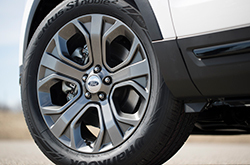 Buy a 2018 Ford Explorer in the Phoenix area and you'll also benefit from standard safety equipment like airbags, AdvanceTrac with Roll Stability Control, traction control, an SOS Post-Crash Alert System, Safety Canopy System and LATCH. If you've been shopping for vehicle models like the 2018 Honda Pilot, GMC Acadia and the Toyota Highlander near Phoenix, you should look at the 2018 Ford Explorer. You may realize that its eye-catching exterior styling and features are just what you need in a daily driver. See if the 2018 Ford Explorer is right for your specific needs, then browse our website to find up-to-the-minute information on exclusive dealership offers. 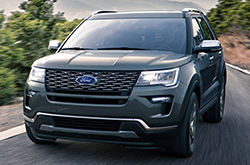 As your resident Ford car retailer, we're the spot to find factory offers on the Ford Explorer, as well as other new and gently used vehicles. When making your ultimate buying decision, we hope our 2018 Ford Explorer review offers the facts and figures you to make an informed purchase. 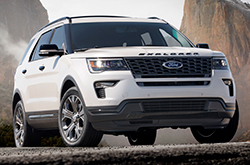 It's beyond doubt that the excellent new Ford Explorer is worth considering; visit for a test spin at Peoria Ford to see the new model personally. Hoping to see its exterior design before you visit? Check out our video to get a peek at its features!